I feel like I am back in school writing essays but if I choose to write about the country then I can not miss its festivals . And India is a barrel full of festivals with its 28 states, 7 union territories and 18 major languages(1600 dialects), each having their own name and way of celebrating these festivals. It’s that time of the year when I do not venture out of my home. Yes, people its HOLI. It’s not like I have always avoided this celebration. In fact few years back during my high school board exams I was an enthusiastic participant of this festival of colours. However the excitement died down with growing up years and now with a husband who is absolutely wary of this festival, its only for our daughter that the ‘gulal’ finds its way to our household. One story goes about the Asur king Hiranyakashipu(demon king) who procured a boon of not getting killed in either day or night, skies or ground and neither by human or animal. He considered himself invincible, thus. He was against worship of Lord Vishnu, so much so, that he tried to kill his own son because he was an ardent devotee. Hiranyakashipu asked for help from his sister ‘Holika’ who also had a boon of not getting burned by fire. The aunt Holika sat on a pyre with her nephew in her lap. But instead of Prahlad (the nephew) , holika got burned. To this day Holi is burned denoting the end of evil. There is a story about Kaamdev- the god of love who had to face the ire of Lord Shiva after he broke Shiva’s trance to make him fall in love with goddess Parvati. He was gifted his life back on this day and even today offerings of mango are made for him. 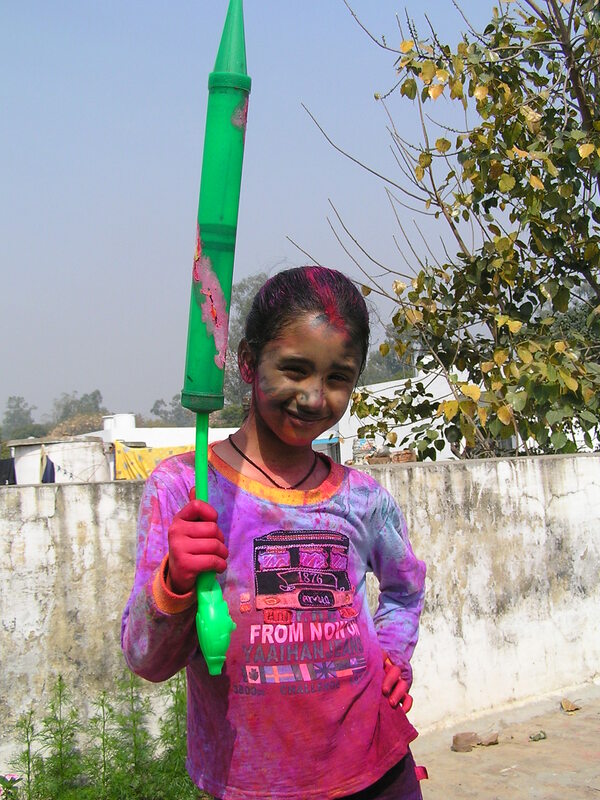 Celebrations involve smearing wet colors with ‘pichkaris’ or dry colors with palms on each other and retorting cheekily ‘bura na mano holi hai’. Manipur has six days long celebrations of Holi. In the state of West Bengal this festival is celebrated as’ dol yatra’. The ill practice of consuming ‘bhaang’ and liquor however certainly mars the celebrations because intoxication provokes some men to indulge in rowdy and lewd behavior towards women. However, once the children having played with wet colors to their fill return home, it is difficult for mothers like me to make them neat and clean again for the next day. The quality of colors is quite harmful and the color stays on for a minimum of three days before the skin reruns to its regular hue. Bhaang, harmful colors, skin irritations etc -that apart, all in all this festival is truly fun frolic filled. It marks the end of winters and beginning of spring season and starts the ‘Vasanta Utsav’. I love festivals . They are fun and colorful. I grew up around fiestas so this post reminds me of home. Thank you…. Almost all Indian festivals are quite colorful and there are a lot many festivals too all through the year! Colourful, indeed! That young girl looks so beautiful even with those paints on her face.